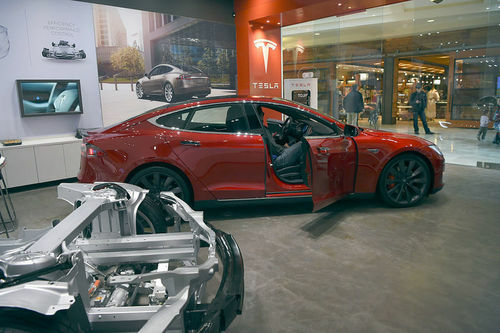 Tesla CEO Elon Musk says the company's Model 3 sedan has passed regulators' testing, as the company looks to begin production on the high-volume sedan this month. 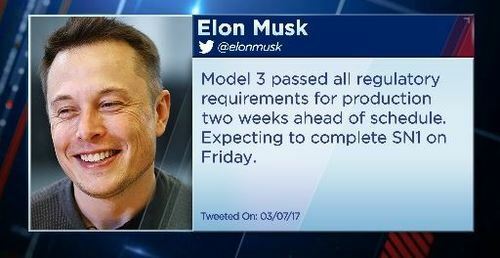 In a string of tweets, Musk said that the Model 3 approval was 2 weeks ahead of schedule. He added that he expects to be able to make 20,000 per month by the end of the year. Musk said earlier they will be priced around $35,000 each. Stock markets kick off the second half of the year on a lacklustre note, after the Nasdaq ends the first half with the worst week of 2017 and yields rise across the globe. This despite strong economic data from two of the world's biggest economies. Business confidence in Japan hits its highest level in more than three years, while China's manufacturing sector returns to growth in June. Saudi Arabia and its Gulf neighbours give Qatar another 48 hours to meet their ultimatum, after Doha says their demands were made to be rejected. Beating them to the punch! President Trump takes his fight against the media to a new level, tweeting a mock wrestling video portraying him bashing a CNN logo. 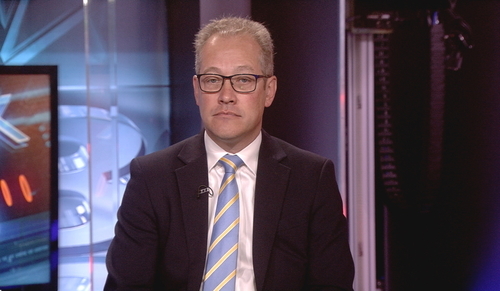 Lothar Mentel, the CEO at Tatton Investment Management, says markets are overreacting to central bank comments. That nervousness of the markets is exactly why we've gone 5 percent equities underweight, because we see them just overreacting to any piece of news that comes out because they feel quite highly valued. Cloud storage company Dropbox is considering going public. That's according to a Reuters report, which says the tech company is talking to investment banks about underwriting a potential IPO. Dropbox was valued at nearly $10 billion in a private fundraising round in 2014. Its flotation would be the largest tech IPO since Snap's blockbuster listing earlier this year. Meanwhile, food takeaway service 'Deliveroo' is set to become the latest European tech firm to gain 'unicorn' status. The start-up is in talks with investors, including SoftBank, on a fundraising round that would value it over £1 billion. 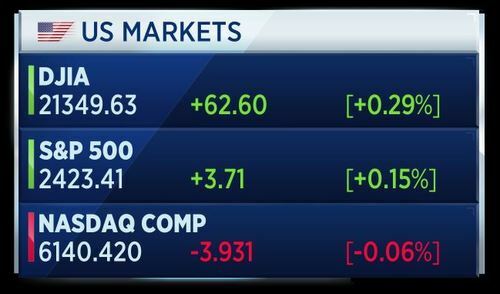 U.S. markets finished mixed on Friday, with the Dow and S&P closing a little higher while the Nasdaq fell nearly 4 points. The Nasdaq ended the first half of the year with its worst week of 2017. Pierre Moscovici, European Commissioner for Economic and Financial Affairs, says it is out of the question that France would seek a delay to going below 3 percent of public spending target. Meeting the EU target of reducing the country's public spending deficit to 3 percent in the first major test for new French president Emmanuel Macron. Moscovici says he has confidence in the French government over taking the necessary economic measures. Tesla CEO Elon Musk says the Model 3 car has passed all its regulatory requirements ahead of schedule. Japanese Prime Minister Shinzo Abe's Liberal Democratic Party has been defeated in the Tokyo Metropolitan Assembly election. 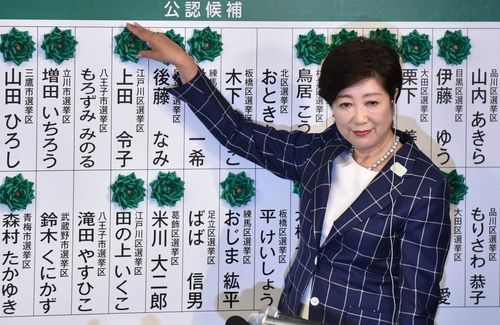 His party lost more than half of its pre-election seats, scoring its worst ever result in a Tokyo poll. The poor performance follows a series of favouritism allegations involving the Prime Minister and senior members of his party. China's $9 trillion bond market is now open to overseas investors, as Hong Kong and China launch a bond trading link. Airbus says the company is now united under a single brand following a corporate reorganisation. The company says it will now benefit from a simpler structure that enables faster decision-making, less bureaucracy, greater collaboration and increased efficiency. Fabrice Bregier is now the first ever company-wide COO and president of the commercial aircraft arm. The company now has one single corporate headquarters in Toulouse. Polish mobile operator Play says it has gotten its IPO prospectus approved. Saudi Arabia and its Arab neighbours have extended the deadline for Qatar to accept their demands by 48 hours. The Arab states instigated a blockade against Qatar last month, accusing it of funding terror. They have asked Doha to take a number of steps or face further sanctions, including the closure of the Al Jazeera news network, and curbing relations with Iran. 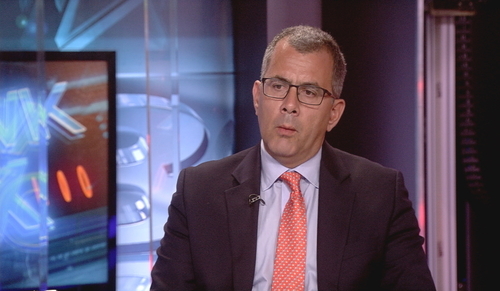 Paul Donovan, global economist and managing director at UBS Wealth Management, discusses how the situation affects oil prices. We’ve seen some of this coming though in the past week. There’s been some upward pressure. But I think fundamentally the oil story is supply and demand and it’s going to be more about demand coming through from the United States and from China in the second half of the year. He says U.S. and China demand will move prices more than the noise from Qatar. Oil prices are higher today. Sweden's manufacturing PMI reaches 62.4 points in June. That's better than expected, with a Reuters poll forecasting a reading of 59.8 points. New figures released by PWC show that the U.K.'s pension fund deficit fell to £460 billion at the end of June. That's a £50 billion decrease on the month before. PWC says a small increase in long-term real interest rates helped shrink the deficit. Steven Dicker, chief actuary at PwC, explained why this is important. What we’re talking about here is the way pension trustees value the deficit, so the way this sort of hits the wider economy is this is what decides how much cash companies need to put into schemes over time. So if you think about it this £460 billion is a huge number, but it’s sort of ten years of about the rate at which companies have been trying to pay off deficits. Norway's Statoil and partners Eni and Petoro have made an oil discovery in the Kayak well in the Johan Castberg license in the Barents Sea. Statoil estimates the discovery at between 4 and 8 million standard cubic meters of oil, or between 25 and 50 million barrels of oil equivalents. Statoil will now make efforts to find a commercial solution for the discovery and to find similar prospects in the Barents Sea. Drilling will next start at Gemini North. 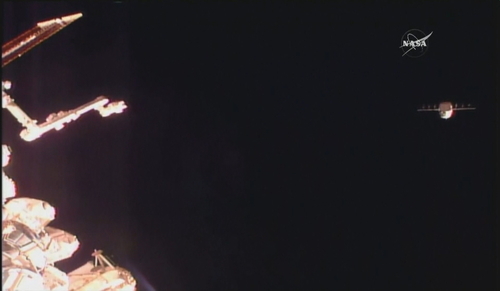 This is live picture of the release of the SpaceX Dragon CRS-11 Cargo Craft from the International Space Station. The mission was contracted by NASA and is being flown by SpaceX, which was founded by Elon Musk. EDF has reported an update on the Hinkley Point C project. EDF says the first nuclear concrete for the building of Unit 1, scheduled for mid-2019, has been confirmed. The project's completion costs are now estimated at £19.6 billion (in 2015 sterling), an increase of £1.5 billion since previous evaluations. London-listed defence and aerospace company BAE Systems has signed a £3.7 billion pound deal with the U.K. Ministry of Defence. The British government has agreed to buy three new high-tech warships, after months of wrangling and delays. 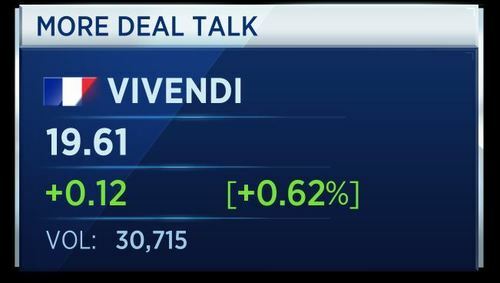 Vivendi has acquired Bollore's 59 percent stake in Havas for 9 euros 25 cents a share. In accordance with market regulations, the French media company said it will now make a full buyout offer for the rest of Havas. Meanwhile, Airbus has integrated its corporate structure under a single brand. The company says this will reduce bureaucracy.Shares in the company are up almost 1 percent. Some data releases have come out this hour. Spanish June manufacturing PMI slips to 54.7 from 55.4 in May. Output fell to 55.8 in June from 57.0 in May. Meanwhile Swiss retail sales fell 0.3 percent in May, compared to a fall of 0.9 percent the previous month. Banco Popular is set to start off-loading around 30 billion euros of toxic assets in a bid to bolster its balance sheet. The bank's new chairman said it would begin looking for partners to buy some of its risky assets following last month's takeover by Santander. Talib Sheikh, portfolio manager for the multi-asset solutions team at JP Morgan Asset Management, weighs in on the sector, saying they have been fairly positive on European equities. We know that (European financials) are making steps to clear up their balance sheet, we’ve seen capital raising. This all looks to be positive and in the same way. I guess the question really is now banks, 6 to 12 months ago, you buy them on a rerating plane and that’s something that we were doing. The question now becomes can they actually grow their earnings. I guess that’s a bit more up in the air. More PMI data has been released. The Swiss purchasing managers index rose to 60.1 points in June versus 55.6 points in May. Czech manufacturing PMI for June was flat at 56.4. That's below forecasts of a rise to 57.0 points. Hungary's June PMI falls to 57.2 points after a revised reading of 61.9 points in May. 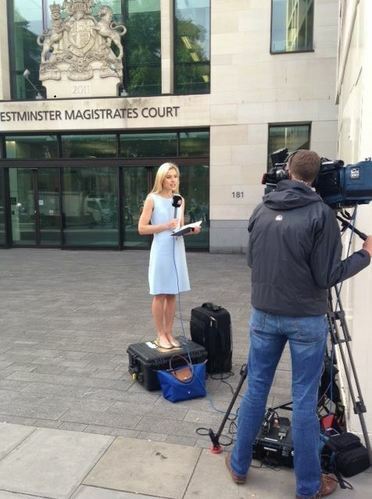 CNBC's Gemma Acton is reporting from Westminster Magistrates Court, where four ex-Barclays executives will appear in court in London today facing charges brought by the Serious Fraud Office, connected to 2008 emergency fundraising in Qatar. These are the main headlines following the start of European market trade. European shares kick off the second half of the year with a bang, following a largely strong day in Asia. China opens its $9 trillion bond market to overseas investors, as Hong Kong and China launch a fixed income trading link. Many companies in the FTSE 100 identify the U.K. as their single biggest source of risk. That's according to a new review by strategic advisory firm Global Counsel. The report finds that 45 percent of FTSE 100 companies are worried about the U.K.'s fiscal outlook, with over a third identifying tax policy as a concern. Lord Paul Myners, vice chairman of Global Counsel, says the survey has charted the major risks facing companies. Of course, companies are on the safer side if they report more risks, so I would expect this number to increase, but it’s risen by over 50 percent and I think that’s very striking and the political component within risk has risen more strongly than any other part. So companies are increasingly focused now on the political risks to achieving their business goals. Italy's June manufacturing PMI order index rose to 56.0 versus 55.8 in May. The manufacturing PMI edged higher to 55.2 points from 55.1 in May. It was forecast to rise to 55.3 points. Norway's sovereign wealth fund has acquired a 49 percent interest in 900 16th Street in Washington, D.C., an office building with 127,600-square-feet of space, currently occupied by Washington law firm Miller & Chevalie and with views of the White House. The investment cost $74 million, valuing the property at $151 million. Euro zone PMI data is at multi-year highs. 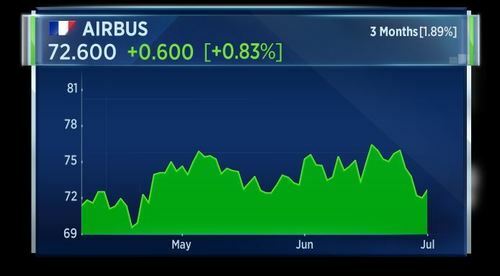 The euro is weaker following the news, but European stocks markets are rising. Akzo Nobel has announced it is acquiring U.K.-based Flexcrete Technologies. It has also agreed to acquire French manufacturer DISA Technology. 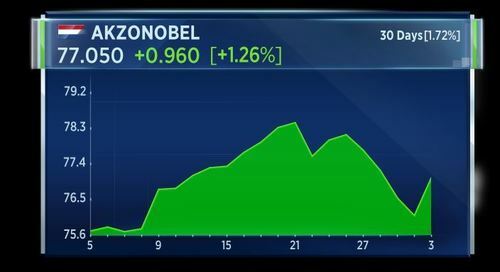 Shares in the Dutch company are up more than 1 percent today. 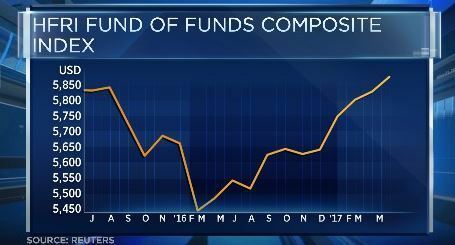 Optimism is starting to return to hedge funds. Overall hedge fund performance has achieved its 7th straight monthly gain, according to the HFRI Index. This is its 14th gain in 15 months. Outflows, however, are still an issue. $9 billion left European managers in the first quarter of this year. 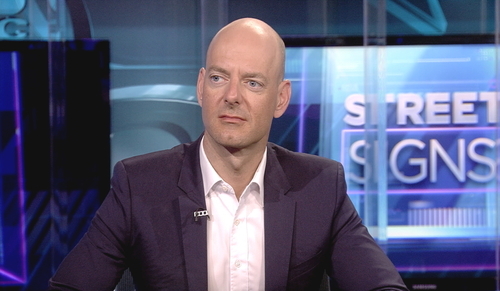 Karsten Schroeder, CEO of Amplitude Capital, says the last couple of years have been challenging for hedge funds. Depending on the strategies you’re looking at, it wasn’t easy. But we’ve seen a good pick-up on performance this year. If we compare numbers, 3, 4, 5 percent up for the year, which is not too bad. Credit strategies have come back. Our long-shot equity is doing pretty well and also the sentiment from investors has recovered a bit. 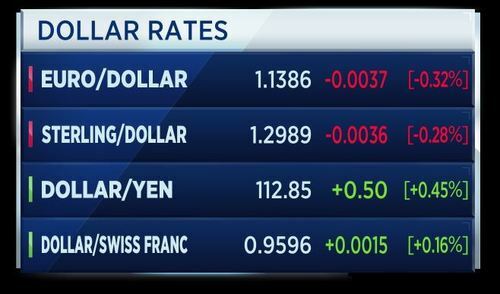 The dollar is performing well against other world currencies today. It hit a six-week high against the Japanese yen, hitting 112.94 yen earlier in the session. U.K. insurer Compre has announced it is setting up an insurance company in Malta. Compre says it has received approval from the Maltese Financial Services Authority. It says the move to Malta is not in response to Brexit, as it had been the intention long before the U.K. referendum. However, the company adds that a regulated presence within the European Union would not be a disadvantage. 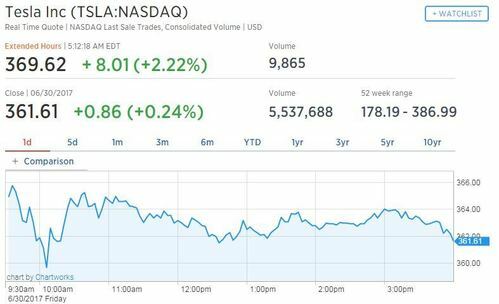 Following the details that Tesla's Model 3 has passed all regulatory requirements, shares in the company are up more then 2 percent in premarket trade. Spanish new car sales rose 6.5 percent year-on-year in June, according to ANFAC. 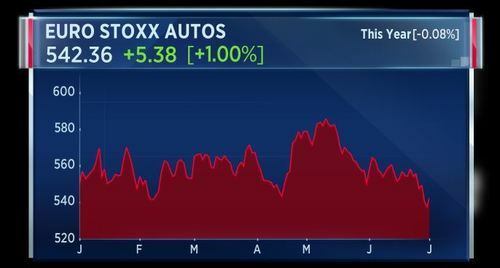 This should help support the Stoxx 600 autos sector, which is up around 1 percent so far today. 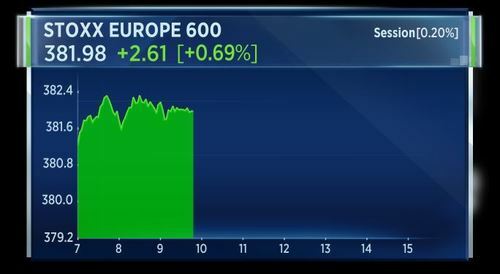 The pan-European Stoxx 600 is up solidly today, recording strong gains at the beginning of the week. 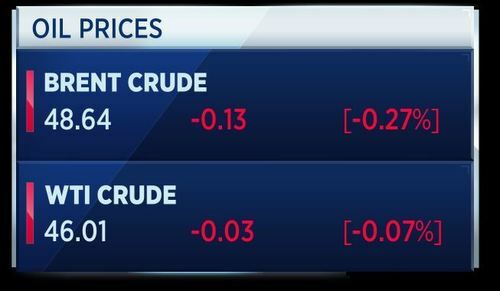 Nick Gartside, chief investment officer of the global fixed income, currency & commodities group at JP Morgan Asset Management, says supply and demand is much more in balance for the oil market. He says oil is stuck in its current trading range due to this balance. Oil was up earlier in the session, but has now slipped into negative territory. 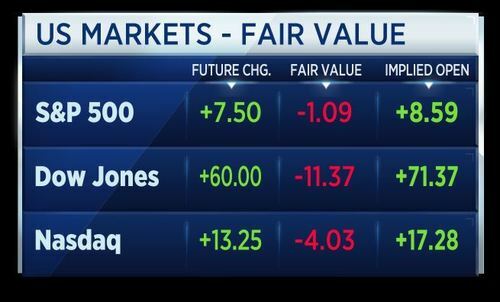 U.S. stock index futures pointed to a higher open on Monday morning as investors prepared for the first trading week of the second half of 2017. 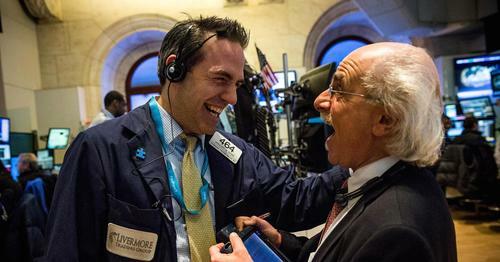 Investors will only have three full trading days to digest a slew of economic data this week. The stock market closes at 1 p.m. on Monday and will not open Tuesday because of the Fourth of July holiday. The Federal Reserve has locked itself into a strategy to raise rates one more time this year despite whoever is leading the central bank, a global economist at UBS Wealth Management said. 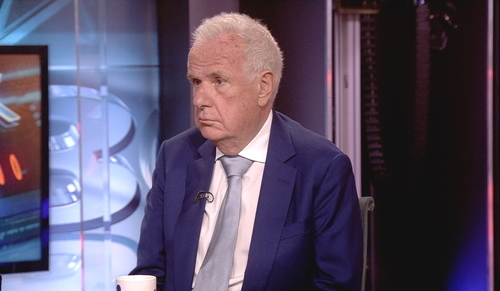 I think there's a realization that policy-makers are accepting we've got more normal economic growth, we've got more normal inflation, and they're going to tighten policy and that's filtering through to the bond markets, Paul Donovan told CNBC on Monday. CNBCThe Federal Reserve has locked itself into a strategy to raise rates one more time this year despite whoever is leading the central bank, a global economist of UBS Wealth Management said. EU Commission says agreement in principle on trade deal with Japan is within reach. That's according to Reuters. Germany's Merkel says key point of CDU/CSU election programme is employment, want full employment by 2025. Says CDU/CSU in election programme prepared to work with new French government to develop euro zone step by step, such as by creating a currency fund. That's according to Reuters. Iran has signed a $4.8 billion deal with a consortium led by French oil company Total on Monday to develop its giant South Pars gas field, the largest natural gas field in the world. 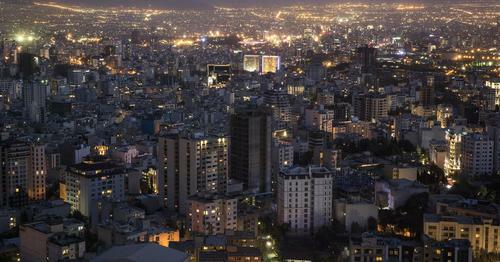 The deal is the Islamic republic's first with a European oil company in more than a decade, marking a major milestone for a country whose standing as an international trade partner has hung in the balance ever since it was slapped with sanctions in 2006 amid concerns that it was developing nuclear weapons. CNBCIran has signed a $4.8 billion deal with a consortium led by French oil company Total on Monday to develop its giant South Pars gas field, the largest natural gas field in the world. CNBCU.S. equities kicked off the second half of the year on the right foot, trading higher on Monday as bank and technology stocks climbed.